Oh my little blueberry-eyes boy! He is nine months and growing. Too quickly, that is. 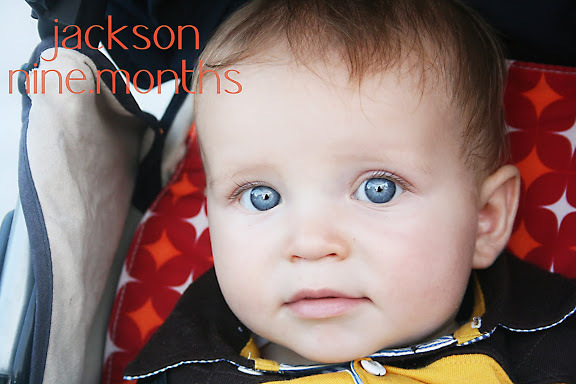 I’m so backward with doctor visits–anyone know if he’s suppose to go at nine months? So I don’t have any stats but here are a few things going on in his little busy life. A very serious/curious child. He likes to examine objects–not much of a test-tastier, more a finger-tester. Pays close attention to different noises. Already saying “mama” and calls for me. Ooh, he is so pretty. What a cutie! Love those eyes! He is beautiful. I love that picture! It is crazy how much different he looks on only 3 months! Those eyes are absolutely gorgeous.